The Magento 2 discussions were great, this is a reality. I saw someone comment on twitter about Magento may miss the launch date at Christmas. Seriously I dont see it at all, they will hit it come what may. This is not the same team from 2011, this team listens and it delivers. Magento 2 is now a reality and its definitely time to start learning it as I suspect it will fly pretty quickly in early 2016. 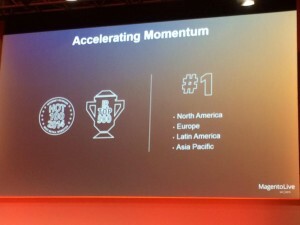 A lot of developers are enjoying working with it and won’t be keen on working on Magento 1 projects, I’d expect a bit of movement of staff, so as an agency you want to get behind it really. There are still some question marks about the complexity and length of time to bring a site up, I suspect the first couple will be painful. And it’s a rewrite of the code, most agencies will have a toolbox of extensions both internal and external that they use, shortcuts, helper tools, etc. Most will need to be re-written. It will be interesting to watch. As we have had 6 years of advancement in technology. For WebShopApps its a great o pportunity, with Magento 2 we are able to start afresh, and we have had our own ‘magento 2’ project going on the last couple of years with ShipperHQ.com so we are more than ready for the future. I wonder how other agencies will find it, especially with the higher quality standards from Magento Connect and need for unit testing. I suspect we will lose some of the lower quality market, deeper development skills required and less around for them to copy you see ;). And there are a number of extensions where the original developer has gone, I suspect some of those companies will struggle. In my mind no bad thing, we should not tolerate crap, and its usually those who it hurts most financially who are the victim. What’s clear is that UK agencies have very much grown up, they are serving high quality merchants, and they need high quality solutions. The bottom of the market is going towards solutions such as Pixafy (and/or off to other platforms such as rapidly upcoming player Enteprise player Bigcommerce), both of which incidentally support the ShipperHQ solution (need to get a plug in there or my Marketing Director Daniel flips at me!). Personally I’m excited about Magento 2. I see this as a solid high quality platform that will serve us over the next 4-5 years. Its extensible, open source, future thinking and robust. The performance figures are looking good, and I’m sure there is more to come on that front especially as we get input from the community such as great developers like Brendan Falkowski. 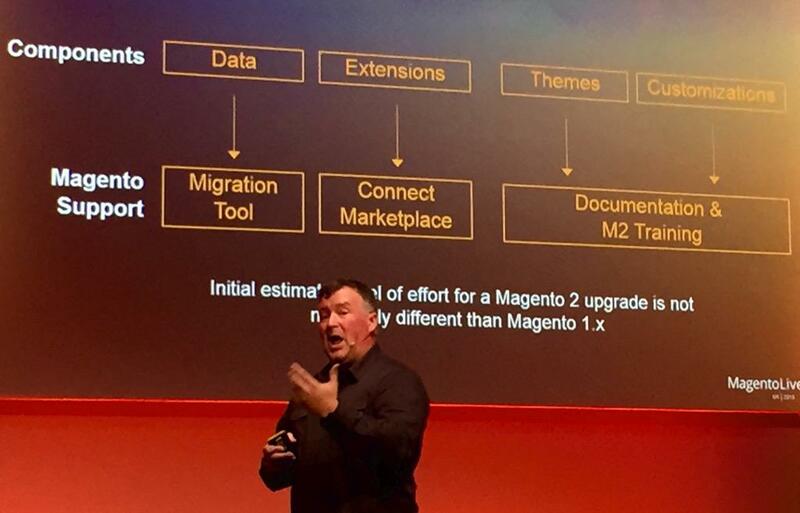 The sky is the limit with Magento 2, with this ecosystem and the solid Magento management wow what a team! 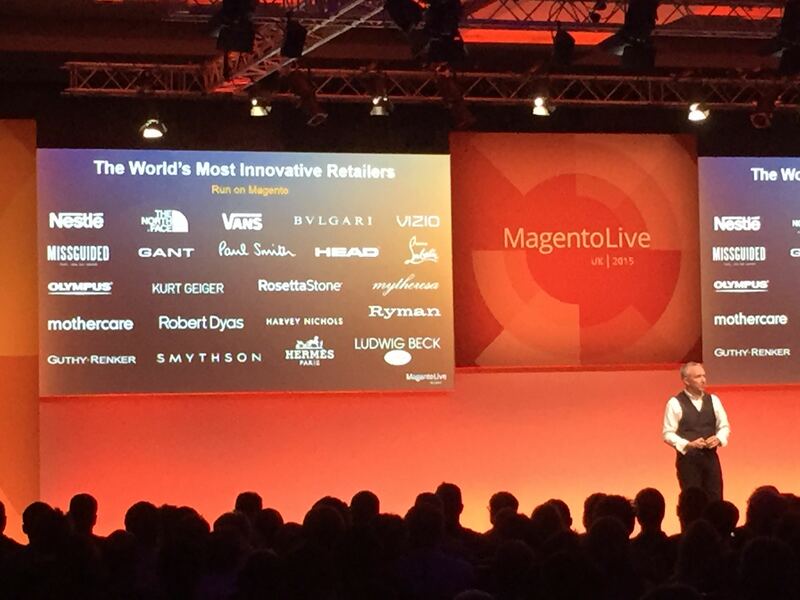 Anyhow enough of that, back to my keywords about Magento Live UK! 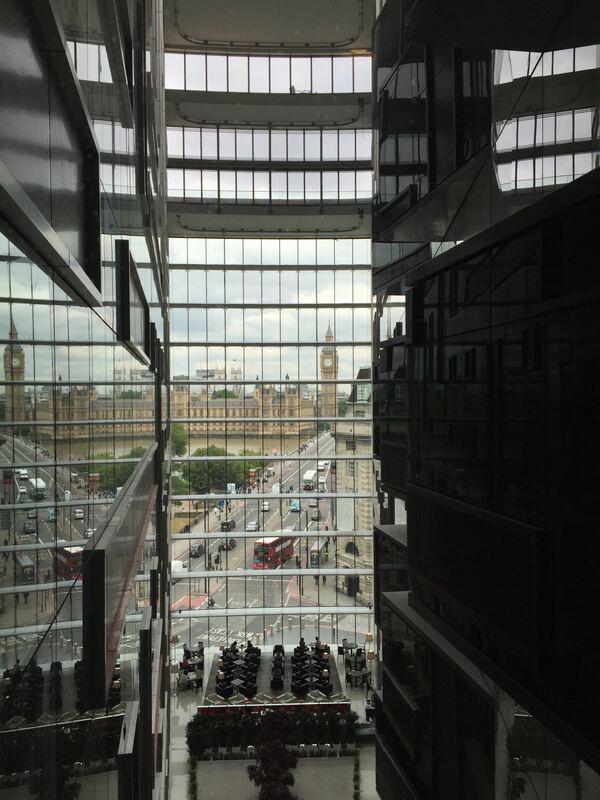 With the backdrop of the Houses of Parliament and Big Ben the Magento Live conference doesn’t have to try too hard with the stage or the venue, its there already. Unlike Vegas the Magento Live UK event is much more low key, and I’d argue they toned it down some more this year, Magento made it not an event about them, but an event for and around the Magento ecosystem across the UK (and with a fair amount of european attendance which was lovely to see). The attendee really set the tone and the tone was typical english understated, polite and welcoming. Ben Pressley did a great job residing over the keynotes, he has a genuine charm about him, and after his reference to Back to the Future a few of us were referring to him as the new Marty McFly! But he didn’t turn on the spin, he is a realist and different from the Bob Schwartz’s and Gary Forman type approach. 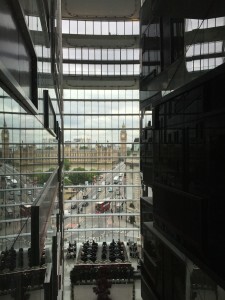 It was all pretty calm, no craziness (well apart from the Axa guy who well…). It powers 28% of the top Alexa 100K sites in the world – 28%!! And this is right from the mom and pop store all the way upto major enterprise sites. 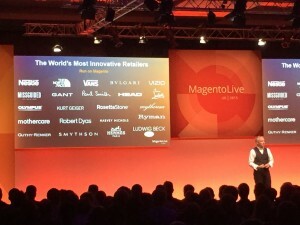 Just walking around Magento Live I was bumping into diverse merchants from across the country such as Smythson, Mothercare, Boohoo, Paul Smith, the RSPB even. Over 300 merchants were in attendance, thats nearly half the audience. Fantastic, I remember the days when it was just developers. How things have moved on. Other people that are growing in stature and confidence are Ted Pietrzak (who refers to himself just as a humble engineer, but actually is Head of Technology), Ryan Thompson (Head of Small Business but seems to be the ‘glue man’), and Anton Kril (Magento 2 Senior Software Engineer, and a whole lot more). Different people, very different skills, but you can see working extremely well as a team. I love seeing different agencies talking to each other, Magento truly is a welcoming and unique community. There were lots of new faces, and quite a few of us ‘old hands’ aswell. I would reckon maybe 40-50% were first time attendees. At 800 people it was almost the same size as the first Magento Imagine. Personally I spent some time with new developers in the community and upcoming offerings such as ShopGoMe which promises to be a great cloud offering for Magento in the MENA region. It was great to share ideas, discuss new opportunities and colloborate with this wonderfully diverse community. I met developers that were coming over from WordPress, working in London but on the low end of the market, and shared with them details of the meetups, the great resources such as Stack Exchange and the Magento Forums, discussed how we began, and encouraged them to just ‘go for it’. It’s my strong belief that together we are much stronger than apart and I would encourage everyone in this community to reach out to your peers, whatever your level and share because together we will succeed so much more. From our side lovely to see agencies in the ‘flesh’ such as Screen Pages, Red Box Digital, Yoma, Creare, Webtise, Session, Williams Commerce, Space48, to name just a few! Apologies to those I’ve missed, there were too many to mention! My conclusions from talking to these agencies was that they are laser focused, passionate and ready. This message was highly effective. We sit back and look where we were and where we are. Who would believe that an open source piece of software really that was developed mainly in 2007/2008 would still have such relevance today? And the reasons are because its not legacy, this ecosystem has pushed and pushed, the merchants have demanded more and we have responded. 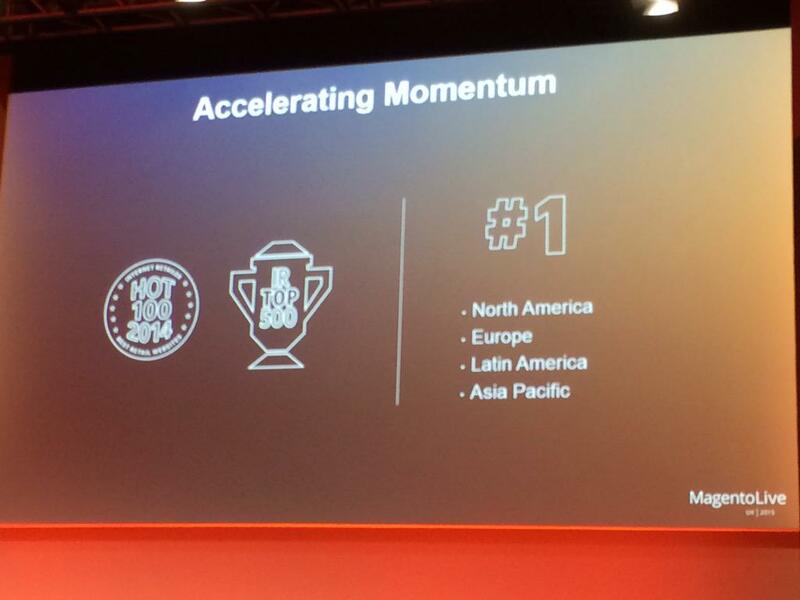 The worlds most innovative retailers are choosing Magento, and there are a 1000 reasons why that is working. Great conference, as always Keren Aminia and her team did a fantastic job with the event coordination. Bring on next year! Thanks for having me back London, now time to relocate the US WebShopApps team to Austin, Texas!! This entry was posted on Monday, June 29th, 2015 at 11:51 am	and is filed under Uncategorized. You can follow any responses to this entry through the RSS 2.0 feed. You can skip to the end and leave a response. Pinging is currently not allowed.